Stepping onto the Black Coyote Winery in Napa Valley two days before a large event exclusively for club members, you will find Vanessa Robledo tying up loose ends, taking inventory on the reserve cabernet sauvignon, and helping her brother unload dry goods. Robledo is the owner and CEO of Black Coyote Wines, and it is a title she has been working toward since she was eight years old. In 1972, Robledo’s parents left Mexico in hopes of creating a better life for their family. Despite having neither high school educations or speaking English, they took a leap of faith and moved from the small town of Michoacán to Sonoma, CA. Four years later, in 1980, they moved to Napa, CA and purchased their first 13-acre property. When Robledo wasn’t at school, she could be found in the fields. It was her grandfather who taught her not only the grape growing process but also an appreciation for the land. “He always said if you take care of the land, it will take care of you,” she recalls. By listening to Robledo describe each grape by the shape of its leaf, one can plainly see that she isn’t reciting facts off a sheet but rather has 30 years of experience working hands-on with the fruit. Growing up, Robledo would translate for both of her parents. Her father brought her to business meetings and realized that his daughter had a knack for interacting with other vineyard owners. However, traditional family values meant Robledo would remain in the kitchen and become a stay-at-home mother. “I did want to have a family and a career, too. I believe that as women we can have it all,” says Robledo. Robledo’s grandfather Everardo Robledo “Papa Lalo” (kneeling front, left) is pictured here in the only photo she has of him. 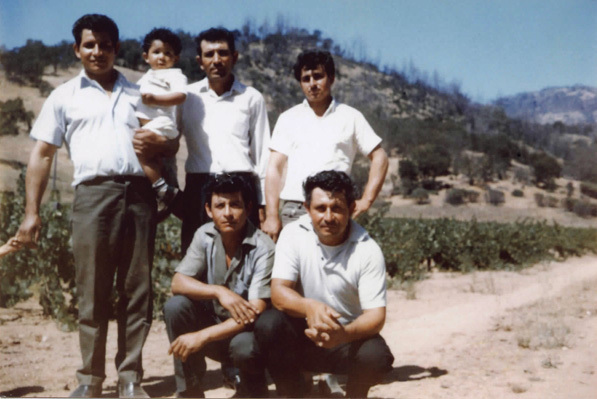 By the time the photo was taken (the 1960s), the Robledo’s were known as master grafters in the wine industry and were sought-after in the new development of vineyards. It wasn’t an easy task, but Robledo convinced her father to let her continue her education alongside her older brother at Napa Valley College. She married at the age of 19 and had her only daughter, Jocelyn. Robledo left Napa Valley College to continue her studies at the University of California, Davis. She wanted to fully immerse herself in learning the ins and outs of the wine industry. “Anything I felt that was a weakness of mine I would take a class on and turn it into a strength,” says Robledo. After honing her winemaking skills, she wanted to master the business. In 2008, she received a scholarship to attend an entrepreneurial MBA program for two weeks at Tuck School of Business at Dartmouth. In 2007, Robledo walked away from the family business and used her industry experience at food and wine festivals. Robledo met her future business partner Dr. Ernest Bates, the founder of Black Coyote Winery. Robledo admits the transition wasn’t an easy one for her family or her new business venture. The recession hit the high-quality wine industry hard, not excluding Black Coyote. The average price for the company’s reserve cabernet sauvignon is $106.Although the Robledo family owned two wine-related businesses (Robledo Ranches and Robledo Vineyard Management, LLC), it was Robledo’s sister Lorena’s marriage to a vintner that led Robledo’s father to start a winery of their own, and he wanted Vanessa at his side. “He viewed his family of nine children as a part of his business,” says Robledo. In 2002, Robledo Family Winery officially opened its doors and became the first Mexican-American established winery in the country. Within the first few years, the family winery acquired 14 vineyards. A large part of the company’s success was due to Vanessa’s marketing campaigns and savvy networking ability. “I knew how hard my parents were working, and I felt obligated to work as hard as I could to help them,” says Robledo. With her help, her family grew its winery from 100 cases of wine to 20,000. Although she was a major asset to the company, her father would hand the family business to her brothers. It was then Robledo knew she would have to break the status quo once again and venture out on her own. Despite Black Coyote hitting a rough patch during the financial crisis, it is now selling more than 600 cases of wine per year. Black Coyote specializes in making two cabernet sauvignons (one reserve and one nonreserve) and a sauvignon blanc. She has three other business partners but Robledo is responsible for the farming, winemaking and administrative work. Despite her tightly packed schedule, Robledo still finds time to help her mother run the family vineyards and give back to the community. Robledo was the former president of the Ernest Bates Foundation, which supports children who live below the poverty level and teaches English as a second language before kindergarten. Drawing upon her own background has given Robledo a passion for supporting youth and encouraging higher education.